It is well known that 3,3′,5,5′-tetramethylbenzidine (TMB) can be oxidized into blue or yellow oxidzed TMB (oxTMB) with the catalysis of peroxidase or mimetic enzyme of platinum nanoparticles (Pt NPs). In this work, we found that TMB could be oxidized into very stable black oxTMB with the catalysis of Pt NPs under certain chromogenic reaction conditions. For the first time, the black oxTMB was revealed to consist of nanowires (oxTMB NWs) with lengths of more than 100 μm and diameters of around 100 nm. The black oxTMB NWs showed very strong light absorption ability, thus could be used to greatly amplify the signal of Pt NP-based immunochromatography test strips (ICTSs). 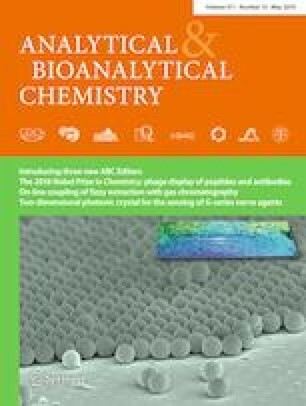 The Pt NP-based ICTSs with black oxTMB NW signal amplification have shown much better assay ability (linear response range and limit of detection) than those of gold nanoparticle (Au NP)-based ICTS, Pt NP-based ICTS, and Pt NP-based ICTS with blue or yellow oxTMB signal amplifications. 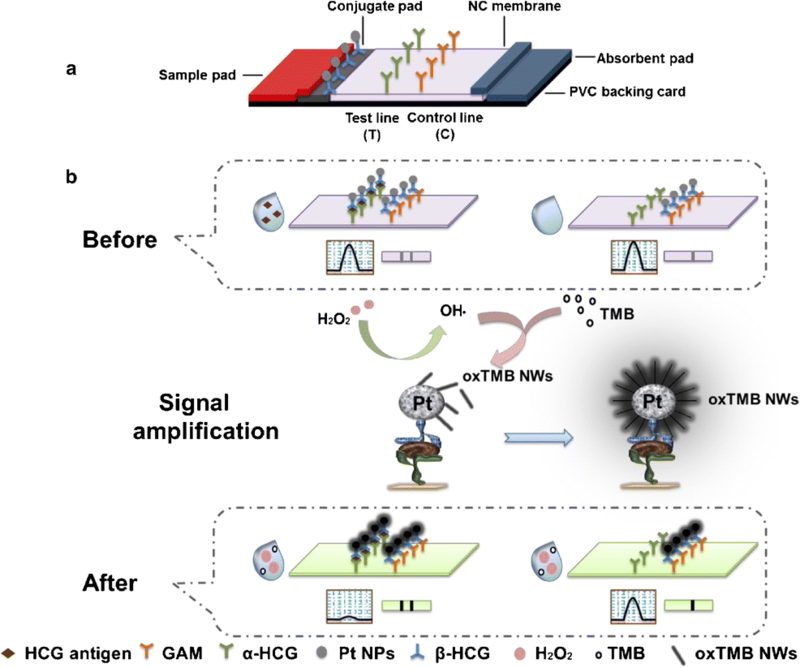 The developed Pt NP-oxTMB NW-based ICTS has been demonstrated to be a new, accurate, sensitive, selective, and rapid immunosensor for quantitative detection of antigens such as human chorionic gonadotropin (HCG). The online version of this article ( https://doi.org/10.1007/s00216-019-01745-x) contains supplementary material, which is available to authorized users. This work was financially supported by the National Natural Science Foundation of China (21675027), the Program for Scientific and Technological Innovation Leading Talents in Fujian Province, and the Program for Changjiang Scholars and Innovative Research Team in University (No.IRT_15R11). All experiments were approved by the Ethics Committee at Fujian Medical University Union Hospital and performed in accordance with the ethical standards. Informed consents were obtained from all individual participants in accordance with the guidelines for conducting the clinical research.